Though functional and inexpensive, chain-link fencing fails to provide the privacy many homeowners desire and can give an otherwise charming yard a rather stark appearance. The popularity of chain-link fences has declined so much that some cities have gone as far as to ban homeowners from installing them. Luckily, there's no reason you have to hate your chain-link fence. 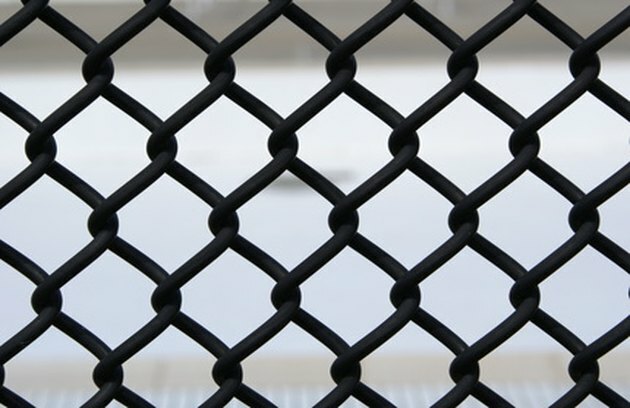 There are a few things you can do to help make your chain-link fencing look better. Mow your lawn and pull any weeds growing around your chain-link fence before performing any other maintenance. Rake and discard the grass clippings and pulled weeds around your fence. Keep your chain-link fence clean and rust-free for an attractive appearance. Scrub the chain-link with a wire brush dipped in warm, soapy water to remove the build-up of rust. Use a rust-dissolving product link naval jelly to remove particularly stubborn rust deposits. After the fence dries, spray it with a liquid automobile wax to prevent the chain-link from rusting again. Paint your chain-link fence to give it new life and improve its appearance. Select an oil-based exterior paint that has been specially-formulated to adhere to metal surfaces. Apply two coats of paint to both sides of your chain-link fence, allowing the paint to dry between each coat. Black paint helps the fence visually recede into the landscape. Thread wood, plastic, or vinyl privacy slats through the chain-link of your fence to make it appear solid. Privacy slats are available in a wide variety of colors and materials, and can be threaded vertically or diagonally, depending on your preference. Plant shrubs, vines, flowers or small trees near your fence to help hide the chain-link. Honeysuckle, passion flower, clematis and wisteria are just a few examples of fragrant, beautiful vines that can be trained to grow up your chain-link fence. You can even train some forms of small fruit trees to grow flat against your chain-link fence using a technique known as espalier. Consult your local nursery or garden center to determine which types of flowers, trees, vines and shrubs grow best in your area.